Hostech Review 2019: Is Hostech a Good Hosting? Hostech is a relatively new website hosting provider offering no-frills packages suitable for beginners and small businesses. Founded in 2014, Hostech is a relative newcomer to the website hosting scene. They do not advertise how many customers they currently have or where they are located, which suggests they do not yet have substantial market penetration. Their website and support are available in French and English. Hostech offers a streamlined selection of website hosting services including domain name registration, three shared website hosting plans, reseller plans, and SSL certificates. A consequence of their simple, easy-to-use, and jargon-free website is that it does not include very much information about their technology, hardware, infrastructure or uptime. Obviously, it is hard to make an informed decision without knowing where their data centers are located, what their uptime is, and whether they back up your data. From the limited information available, their website hosting packages seem to be most suitable for beginners or new website users who will be attracted by the free domain name (except for basic package), website builder, SSL certificates (except for basic package), and web applications such as WordPress, Joomla, and Prestashop. However, expert users will likely require more advanced scripting languages such as Ruby, Ruby on Rails, and Python. PHP 5.4 seems to be supported, but this is far slower than the PHP 7.2 that many other providers offer. Hostech offers three shared website hosting packages: Essential, Professional and Business. The two base packages are very affordable and much more competitive than both local or international companies, but the most expensive package is very highly priced. That said, it does offer a lot of features including unlimited disk space, bandwidth, MySQL databases, FTP accounts, marketing tools, advertising credit, and SSL certificates. 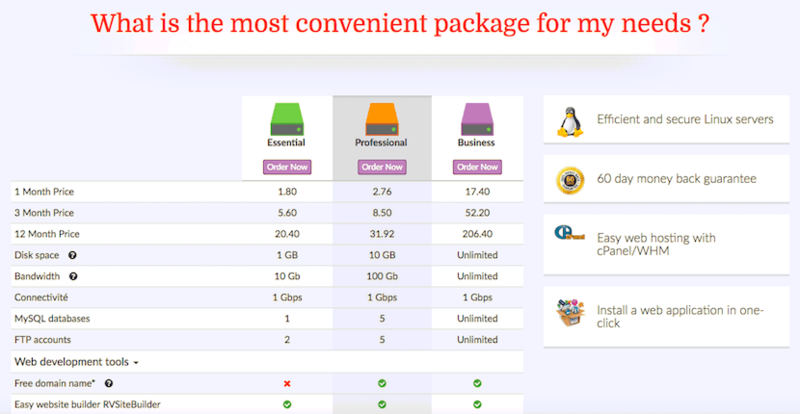 The nicely priced middle package includes 10 GB disk space, 100 GB bandwidth, and a free domain. Most everyday website owners will fit easily into this plan. Hostech offers three contract terms – monthly, quarterly and annually – with the prices changing negligibly as your commitment increases. Bizarrely, three months upfront actually costs more (pro rata) than the cost of a single month. They offer a 25% discount for all new customers, which they sell as “get the first three months free,” and they also offer an amazing 60-day money back guarantee. As with the rest of their website, their customer support options seem to be really stripped back. They only have a contact form on their website, and I have found their customer service to be slow at times. They do have Facebook, Twitter, and Google Plus pages, but these are not highly populated. Hostech is a no-frills provider that integrates with well-known technologies such as cPanel, Cloudflare, CentOS, and RVsitebuilder. The two basic plans could work well if you’re operating on a beginner’s budget, but advanced users will likely require higher-end features. Wondering how Hostech stacks up against other Web Hosting companies? Enter any other Web Hosting company and we will give you a side-by-side comparison.